A full line of bubble wrap in the most convenient sizes and specifications, so that our customers can benefit from this multi-use and attractive packaging medium. Because its small air cells absorb shock, bubble wrap is ideal for filling voids in packages, cushioning products, and protecting their surfaces. Products packed with bubble wrap do not move or slide during shipment. In addition, the plastic material possesses high tensile strength and excellent air retention, so the material does not go flat but continues to provide superior product protection. For superior protection, the most delicate items should be protected with larger bubble wrap with ½-inch-high bubbles. 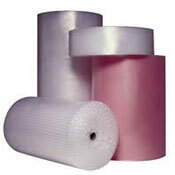 Bubble wrap rolls can be customized to increase the efficiency of packing operations. Stock rolls are perforated at 12-inch or 24-inch intervals. They can be perforated at almost any interval, making it easy to tear off just the right size piece and avoiding the necessity of cutting tools. Also, the 48-inch rolls can be cut into smaller widths for specific packing jobs. In addition, the use of specialized dispensers can further increase efficiency. Some packers have the tendency to wrap fragile products too tightly in bubble wrap. This can cause damage to the products because any impact is transmitted to the product instead of the bubble structure of the packing medium. Our stock bubble wrap comes in two sizes – 3/16 inch (small bubble) and ½ inch (large bubble) – which refers to the measurement of the height of the air cell. 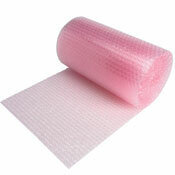 The large bubble wrap comes in 250-foot rolls, in 12-inch, 24-inch and 48-inch widths. The small bubble wrap comes in 500-foot rolls, and in 12-inch, 24-inch and 48-inch widths. Also, bubble wrap is available in both standard and anti-static, and adhesive and cohesive varieties. Our bubble wrap is CFC-free, which will not harm to the environment.